As always, there is a fabulous range of stallholders ready to sell you the freshest and the best produce this Sunday at the Bream Creek Showgrounds, from 9am-1pm – we hope to see you there! Leap Farm – fresh from the green felds of Bream Creek, Leap Farm produce amazingly tasty goat meat and ready made goat dishes such as ragu and curries – one of our most popular stalls so get in early! Beanyard Coffee, Pat Burke and Dougal Harris – fresh hot coffee and homemade biscuits, using Tasmanian roasted coffee and Tassie teas. Duggan Brand Apples – from the apple growing paradise of the Huon Valley. http://www.huonvalleydirectory.com.au/directory-listings/item/duggans-brand-apples-and-pears. Jakob’s Pantry – old fashioned cakes, tarts, pies and pastries – a hot favourite so be sure to get in early. Little Quion Farmhouse, Michael & Jenna Gray – vegetables, herbs, preserves, ready-to-eat pork rolls with apple sauce. Michael and Jenna will also fresh free range pork in all types of cuts – roasts, steaks, chops, cutlets and roasts. Just perfect for this wintery weather. Community Stall– packed with goodies grown and produced in our local area, come and support your local community! Sirocco South, absolutely delicious fresh pasta, lasagne and sauces. Bream Creek Pudding Co. – amazing home made puddings with old fashioned flavour, ready to take home and pop in the oven for a Sunday night sweet treat. 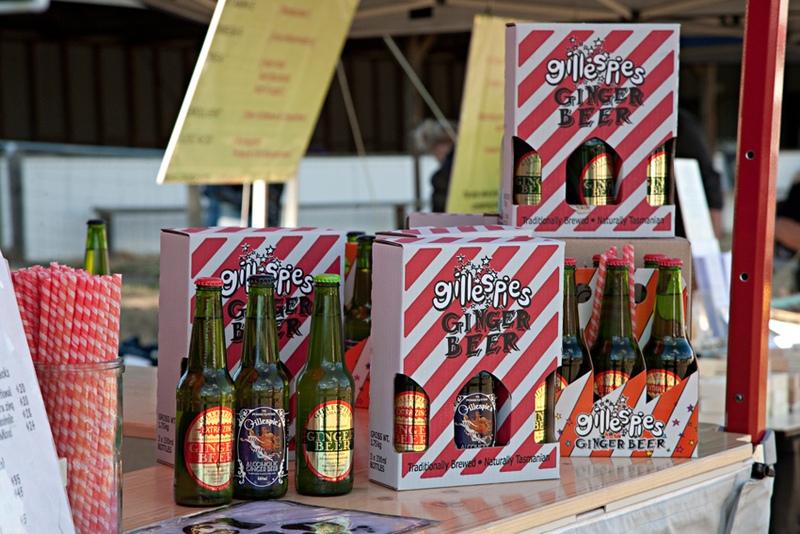 Gillespie’s Ginger Beer – locally made, refreshing and delicious ginger beer – with a little kick of booze if you choose!